Quote(s) of the week - or maybe the year! Two lovely ones, to round off 2009! "Popped up to the yard today and one of the farriers was there and asked how Paul was. He seemed surprised that barefoot would make that much difference and said "Well of course barefoot horses can only work at most 3 times a week and you definitely couldn't do that kind of thing with a thoroughbred, it just wouldn't cope. Its only natives that are hardy enough". My thoughts flipped to Hector and I bit my lip...hard!" And from a friend, last time Charlie and Felix were out hunting - we were just ahead of her going up an impossibly stony path, a washed out stream bed with boulders and fllints sticking up all over the place. She watched them both storm up it, and said at the top: "Its quite incredible what your horses achieve without shoes"!! These photos show Paul's progress over the last month. Paul's owner came to visit him today, and was surprised to find she was going to ride him out! He has made great progress in the month that he has been here, and although I've only ridden him a few times, I wanted her to get a feel of how he was doing, and to give me some feedback as to whether he had improved as much as I thought. It was lovely to see him and his owner together again, and she agreed that he is much sounder and more balanced than he was when he arrived - good job Paul, and I am hoping he will have a perfect start to 2010! No Boxing Day meet...trying again today! The thaw hadn't set in sufficiently by Boxing Day for hunting to go ahead, although there was a meet and lots of us turned up on foot. Magic day on Saturday - given the current weather maybe the last time we will be out hunting for a while...It hadn't snowed at that point, but the ground was beginning to freeze, and the going was bad enough that we could only go very quietly. 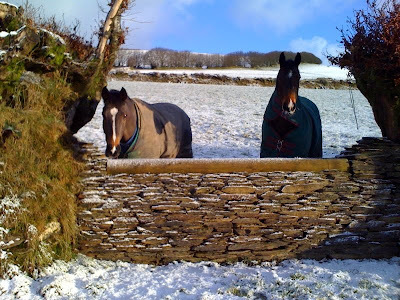 Thank goodness for barefoot horses, who are totally comfortable and sure-footed on snowy, frozen ground and even through slippery gateways; on fields which had been thawed by the sun they were very keen! A frequent problem that comes up when people go about changing their horse's diet is pickiness on the part of the horse. Typically the horse has been used to getting a feed which is mollassed, to a greater or lesser extent, and which therefore smells very appetising. Another factor can be the unfamiliarity of the new feed - some horses, like some toddlers, don't trust novelty at mealtimes and need to be offered a new feed a number of times before they will accept it. With horses who come in for rehab, we sometimes offer their feeds for 2 or 3 days before they will clean up, even though they will eat haylage immediately. I had a copy of the latest review of "Feet first" through from J Allen, and was delighted to see that Forge magazine, the farriers' trade publication, had included a review. They had the odd bone to pick with us, which was only to be expected, but on the whole it's very fair - you can read the whole thing here. "As a farrier I would recommend the book to other farriers, to obtain a different perspective on the equine foot and to understand what is being said in the barefoot world"
Hector has been back in work for some weeks now, and out on exercise, going round the lanes for 5 miles a day has been butter-wouldn't-melt. He is feeling terribly well, so I knew it would be interesting when he started hunting again. He went out twice last week and was OK - small fields, bad ground and was not really argumentative at all. Earlier this week he was a really good boy, 14 miles through deep wet ground and was mostly charming. Today - opinionated and thinks he knows it all (!).... not entirely his fault as there were lots of people out and more intervals standing around, interspersed with other horses performing unscheduled accelerations past him. Still, we had a few disputes and I swore on more than one occasion....Clearly 25 miles a week (not including exercise) is inadequate, so we must try harder(!) Its particularly annoying as he is so fantastic when he stops titting around...! After this clip, I was asked about Hector's previous foot landing, so am posting this - his rehab footage from July-Sept 2008 - for interest. Check your feed bags for fructose! Here's a link to a fascinating article, which was highlighted this week on the UKNHCP forum. Fructose and corn syrup are widely used in commercial horse feeds, and although barefoot practitioners knew that they caused problems, we weren't aware of this research. "There's one more significant side effect of fructose. It cross links - that is, ties up - proteins in what biochemists call the Maillard reaction. This cross linking occurs during the cooking of food, affecting both the taste and the nutritional value of food. But the Maillard reaction also occurs in the human body, and it's suspected as a factor in diabetes and aging"
It strikes me as odd that we use the term "feeling his feet" to describe foot pain in a horse. In people, loss of sensation in hands and feet is a cause for concern, so why do we traditionally prefer horses NOT to feel their feet? For me, one of the huge benefits of riding barefoot horses is their tremendous proprioception compared with shod horses, but there is no doubt that for some horses regaining sensation in their hooves can be an comfortable process. 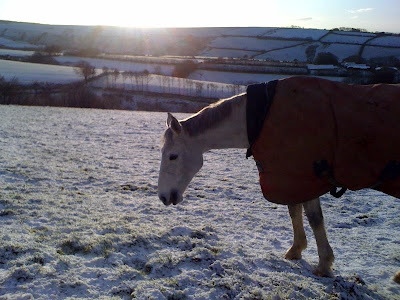 I described in this blog how horses with unhealthy hooves have cold feet in shoes and talked in yesterday's blog how these types of horses often seem fine when their shoes first come off but gradually become less comfortable on challenging surfaces over the next few days. I don't think anyone has definitively explained why this happens, but there could be several reasons. The fact that shod feet are colder could be the reason - after all, if heat is constantly drawn out of shod feet, you would expect them to be more numb, rather as our hands become when we get very cold. Of course, once your hands warm up again, the returning sensation is very painful. Perhaps this is also happening with horses just out of shoes. Another possibility is that, because shoes restrict neural feedback, shod feet have some form of neuropathy, and once neural input is available again then this causes temporary foot pain. Another common cause of foot pain in shod horses is thin soles or weak frogs, and once out of shoes these can cause increased discomfort until they heal. Some farriers routinely trim soles and frogs when shoeing, which is one of the reasons we tend not to take shoes off horses until a few weeks after they have last been shod. If there was no way to alleviate this discomfort, then removing shoes might be a much more difficult decision. Fortunately, this type of foot pain can usually be eliminated by allowing the horse access to conformable surfaces until they are able to cope with tougher surfaces. We filmed Paul, the new rehab, again last week, and I've added the new footage on below. The good news is that he is landing better already, which is an important improvement but, as often happens when you take shoes off a horse with problem feet, he became footy on hard surfaces a few days after his shoes came off. The reasons behind that are the subject of a whole separate blog (!) but in practice it means that the increased stride length we saw initially out of shoes is unfortunately not evident on this clip. It will come back, but it will take a while before he is as comfortable on the ridged concrete as he is on conformable surfaces. Photos 1 and 3 are of course his hooves (LF and RF) as they are today, and photos 2 and 4, in shoes, the day he arrived. If you look at the nail holes, you can see how much hoof he has already grown, just in the 10 days since the shoes came off. You can also see a new angle change showing, which will be more visible in a few weeks. I've had two pieces of good news over the last few days, updates from the owners of Blue and Dexter, two of the former navicular/DDFT rehab horses. "Blue is fabulous and going brilliantly...he coped with a good 2 hours of roads and tracks last week! Hunting soon..."
"Dex was the only double clear at his first attempt at BSJA discovery today! Dressage event in a few weeks, so busy calendar for the old boy!" There is lots more about both of them in previous blogs, and Blue's hoof rehab footage is also up on Youtube. I took some footage of a couple of shod horses the other day, at random - they were literally the first two shod horses I came across, and I wanted to see if it was possible to compare shock absorption in healthy and unhealthy hooves. The barefoot horse is Hector, who had a toe first landing and weak digital cushion when he first came here but has been a hard-working barefoot horse for over a year now, as documented in earlier blogs! Its interesting to see how the weakness of the caudal hoof in the shod horses affects their ability to shock-absorb - you can see the concussion affecting the limb even in walk. In the shod horses, the fetlock also sinks lower as they have much less effective spring and recoil than the barefoot horse. Another big shock is the poor medio-lateral balance on these shod horses - they land unevenly and you can see in slow motion the stress this places on other joints, as hocks and fetlocks twist as they take the load - and this is only at walk! I filmed these shod horses by chance - of course not all shod horses will show this level of imbalance - but what I didn't expect was the way that every step looks more of an effort for them (not surprising after all, I suppose, if they are unable to use their stored energy as efficiently as they should be able to), and how disconnected they appear when they make contact with the ground. The picture at the top is a thermographic image of a healthy barefooted horse. The hooves are a similar temperature to the rest of the distal limb, with warmer areas where blood flow is particularly close to the surface. Looking at the temperature chart, the hooves are about 24-25 degrees, and the floor is about 17 degrees, and you can see the point where the hooves are in contact with the ground and "bleeding" warmth onto that surface. 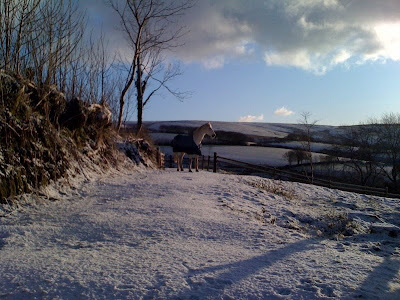 By contrast, the temperature of shod hooves (particularly in horses with caudal hoof pain) is usually much lower and a shod hoof will feel cold - closer to the temperature of the surface the horse is standing on - so in the example above, if the horse were shod you'd expect his hooves to be 7 or 8 degrees colder - a big difference. 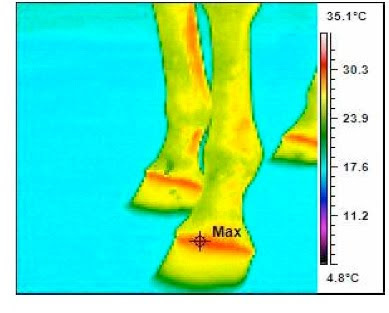 There is no doubt that when you take shoes off, hooves warm up very quickly - with a laser thermometer I've recorded a 10 degree temperature rise in less than an hour. Some people view this as proof that the circulation increases, and that may well be partly true, but it happens even with horses whose feet are unhealthy and it happens while they are standing still, so I don't think thats the whole story. The best explanation, in my view, came from a farrier, who gave me the little blue device in the second photo. Its purpose is to stop computers overheating - its made of aluminium and is extremely efficient at dissipating heat - so much so that its uncomfortable to hold because your hand quickly gets very chilly. The farrier had already made the connection when he gave this to me - the shape of it, and the raised "pins" are very reminiscent of a horseshoe - there is probably no better way of rapidly and continually drawing warmth out of a hoof than nailing a shoe on. I've had a chance to look at the footage I took at the weekend, and here is a short clip of the new boy in his wedges. The two things to look out for are the toe first landing in front and his stride length - he is just about tracking up in these shots, but his movement is rather pokey - its easier to see in the real time footage, but you almost get the feeling that he is "marching on the spot" rather than stretching out. Balaclava - best thing ever! For the last couple of days, the rain briefly stopped (back again today, by the way) and the temperatures shot down to below freezing, crawling back up to about 3 degrees during the day, with a nasty east wind - but at least it was dry. This horse, shod with wedges, has just started his rehab here. His movement when he arrived was an interesting illustration of the effect of wedges, which I posted about here. He was shod on the vet's advice, as he had suffered from long term lameness, and his owner had found that the wedges had alleviated his lameness. However, his overall movement had become choppy and short in front.